Turning Social Entrepreneurship from a "Thing" to the "Next Big Thing"
If you had the ability to change the current state of a pressing global issue, how would you respond? To what extent would you push yourself, especially if it was a concern relevant to everything you stand for? These were the questions I was faced with last September at the onset of Hult Prize at BRAC University. I had just been informed that I was selected to be the Hult Prize Campus Director at BRAC, and for the next three months, my mind was occupied with the task of helping young minds understand that the great responsibility of sustaining future generations falls upon their shoulders. "The Hult Prize is considered the largest student competition in the world" --I've lost count of the number of instances I mentioned this to numerous stakeholders. After adding the partnership of the Clinton Global Initiative and the personal involvement of both President Bill Clinton and Professor Muhammad Yunus, I knew I would have at least five minutes of the listeners' ears and brains. Of course, these are just introductions to the main purpose of the Hult Prize competition, which is to create solutions to the most significant global issues by utilizing the potential of social business. To participate in the Hult Prize, a student has two options: submit an application online, or enter via new approach, introduced by the Hult Prize this year, called the 'Hult Prize @' program. In Hult Prize@, schools host an official campus-based quarterfinal event, and the winning team is fast-tracked into the Hult Prize semi-final regional round, bypassing thousands of applicants who enter online. 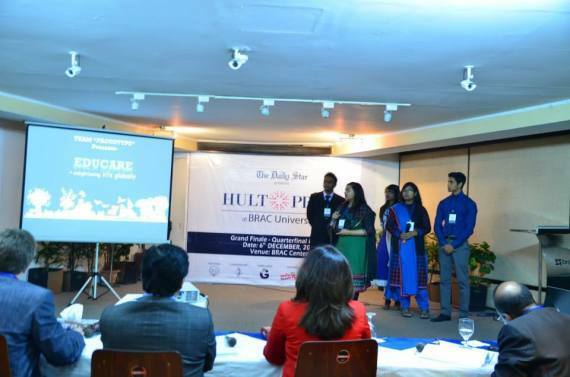 Hult Prize at BRAC University was not just another competition, because this three-month long process helped bring about an entirely new reality for students. Throughout my undergraduate studies, the concept of young business entrepreneurs was all the rave, and was considered a revolutionary "new way of life." This entrepreneurial spirit brings about a positive result: it's great to see young graduates consider setting up businesses and creating employment opportunities for many, rather than pursuing employment solely for themselves. Commercial entrepreneurship is much needed to reinvigorate the economies of developing nations. However, the concept of social entrepreneurship, or creating businesses for the purpose of stabilizing society, and prioritizing that over personal benefit is something very few had realistically considered before this challenge. At our final event, the Pro-Vice Chancellor of BRAC University began his welcome address by contemplating, "We all know, those of us who are getting on with our years, that the brightest ideas come from young minds." This was reaffirmation of what we witnessed throughout the event; that students really do want to utilize their youth, abilities, and time to promote human development. The Hult Prize model and the possibility of seed-funding for the winning team is one way of doing it right. However, there needs to be more sources for jumpstarting such initiatives. Perhaps a system with angel investors and agencies existing for the sole purpose of supporting social business start-ups would encourage aspiring students to take those active steps, and things would pick up from there. 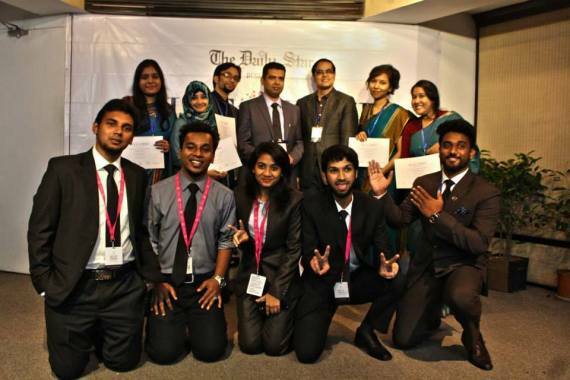 One thing is for certain: the thought of creating social businesses as real solutions to social challenges is now out there, and the young people of Bangladesh are already practicing it. To a great extent, the Hult Prize has reshaped my philosophies of living. Having participated in the competition in 2014, and then bringing it to the BRAC University campus endeared me to the social business cause at the most basic level. Even more deeply, it helped me re-prioritize certain things for my future. I've done a lot of soul-searching in life on everything wrong in the world and whether my insignificant being would someday be able to do something about it. The real possibilities of social business have provided me perspective, and in a way empowered me with the thought that I may be less insignificant than I initially believed -- that my contributions along with others in the Hult Prize community could actually create real impact. This empowerment is very personal and was a driving force for me to work without compromise on the stimulating task of organizing Hult Prize at BRAC University. And the re-prioritization I was talking about? I won't let my life be another 9 to 5 story and intend on ensuring that it is lived first and foremost to help people live humane lives. Hult Prize at BRAC University was a provocative experience not only for me, the organizers, and the participants; It is an idea that has already given birth to many more and its impact will be realized when these ideas are materialized. Besides the formation of ideas, the effect of the event on the students in terms of motivating and inspiring them to think on a new plane has been tremendous. It will provide a sense of achievement to all of us only when we know that social entrepreneurship has become a mainstay in society, encouraging young people to not simply dream big, but to dream great and realize those dreams for the sake of their world.